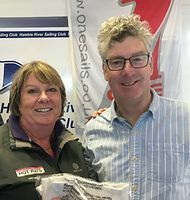 Competitors for Day 5 of the Hamble Winter Series enjoyed a fantastic day of racing with the Hamble River Sailing Club, supported by OneSails. Winter racing doesn't get much better, there may have been a chill in the air, but the sea temperature in the Solent in November is as good as June. Bright sunshine, 15-20 knots of wind over tide, and the whole Solent to choose from, a wide variety of teams and boats revelled in the superb conditions. Principal Race Officer, Stuart Childerley and his team delivered a superb course with one long race for all classes. In IRC One, Chaz Ivill's J112e Davanti Tyres scored their fourth bullet of the series, and was the fastest boat around the track in any class after IRC time correction. "This is the first year with the new boat, and as always it takes time to tune up and figure out the best set up." commented Ivill. "We have been sailing the boat much flatter in a good breeze, and that has powered her up, especially upwind. "Richard Patrick's First 40 Dusty P was second in IRC One, just five seconds ahead of Sun Fast 3600 Redshift Reloaded, sailed by Nick Cherry. In the J/88 Class, Avia Wilmot is having an outstanding debut season, scoring a fifth bullet for the series but only just. J/88 National Champion, Paul Ward's Eat, Sleep, J Repeat was just 17 seconds behind. Gavin Howe's Tigris was third. 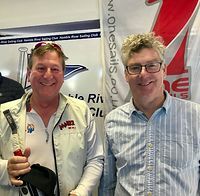 In IRC Two, Mike Moxley's HOD 35 Malice scored their fourth win of the series, Simon Perry's J/109 Jiraffe pulled off the best start of the day to take second place, just 5 seconds ahead of Robbie & Liz Robinson's First 35 Hot Rats. In IRC Three, Jamie Muir's SJ320 Scarlet Jester scored their first win of the series, 50 seconds ahead of Chris & Vanessa Choules' Sigma 38 With Alacrity. David Greenhalgh's J/92 J'ronimo was third, by just 11 seconds after IRC time correction. In IRC Four, Jeff Dakin's Flashheart scored their second win of the series, by just 28 seconds after IRC time correction from Stuart Danby's Mustang 30 Respect. Toby Gorman's Sigma 33 Stan the Boat was third.